Dax had always been a reliable mount - not always compliant, exactly, but reliable. You always knew what you were going to get on a ride with Dax but never, ever did you expect him to be lame. My friends and I used to joke about how sound he was, despite the lumps and bumps all up and down his legs and the straight up/down conformation of his hocks and back legs. Until ... one fateful day ... we brought Dax out of the icey pasture in February 2007 for a lesson and realized we had a problem. Long story short it was quickly determined that Dax had a pulled deep digital flexor tendon on the right hind along with some minor suspensory involvement. His show season was over before he got a chance to get started. He would need, and get, a few months off work. In the late spring of 2007 we were back in the game but this time I was aboard. During Dax's time off Elaine had acquired another mount, Cedar Grove, a younger TB cross from Egon's herd in Carbondale and with whom Elaine was having moderate success as well as a very nice time :-) I started with some light riding and found Dax to be sound so we started conditioning and then entered a few 15-mile Novice endurance rides in our area. This was a blast. 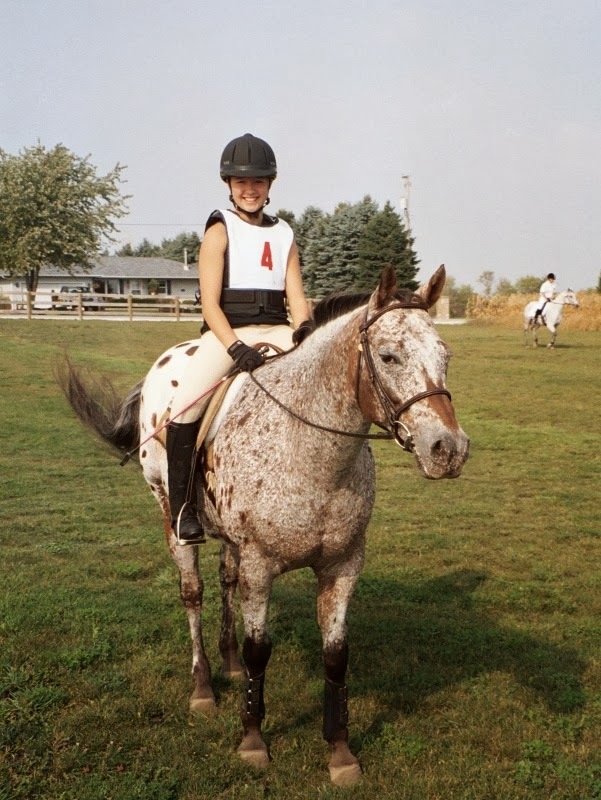 We continued monthly endurance rides in the 15 mile distance for the summer of 2008 and then into the summer of 2009. 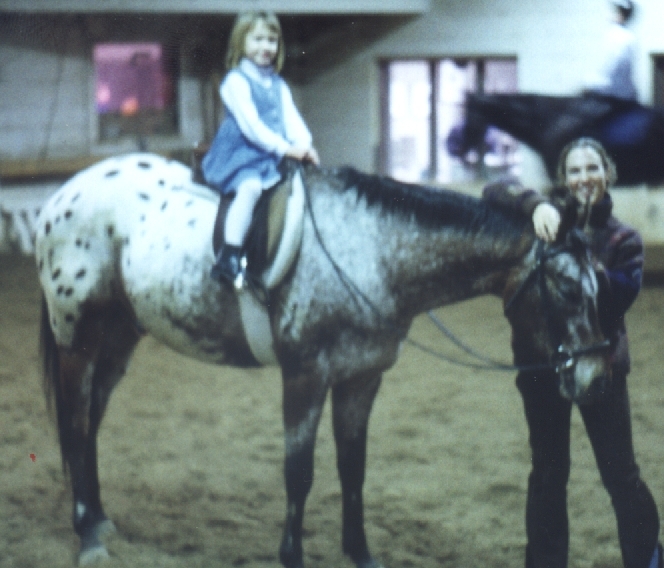 Then I made the mistake of taking Lovag (my fancy show horse) on an endurance ride so that Grace could ride Dax and ended up with a lame dressage horse - two weeks before a show! Dax had to stand in. Spring of 2010 came and Dax's feet seemed unreasonably sore. We had to pull out of our first endurance ride because his feet just couldn't take it. I started to get worried when this persisted. Suddenly one day whilst picking his feet I noticed blood and then the alarms started sounding. I had a long talk with our hoof trimmer and we agreed to do some things differently. I purchased several different hoof products thinking that he was thrushy, or the foot needed to be hardened up. Things started to improve somewhat. In the fall of 2010 we noticed that Dax was head-bobbing pretty regularly at the trot, even with hoof boots on. It was time for the vet. Our lameness vet is a racetrack guy and pretty astute with lameness; due to Dax's age and after watching him move he decided on joint injections for the hocks and an injection to his arthritic stifle (from an even old injury many years before.) He also recommended coffin joint injections. I have always been leery of the injections but decided in the interest of eliminating hocks and stifle from the equation to go with those two but skip the coffin injections. From there, Dax was not comfortable without Bute (NSAID) and regular Adequan injections (intra-muscular; not a joint injection.) Even then, it was anyone's guess how sound he would be day to day. He was being ridden only very lightly at this point since we still had no idea what was wrong but clearly the injections had done little to nothing to help. He was now not only clearly sore on both front feet but also lame somewhere, causing the head bobbing and very "off" gait. Something was going to have to be done, but at this point we weren't sure what. We gave Dax a lot of time off in the winter of 2010/2011 and he was still off and on going into spring 2011. Note: this is part one of a three-part story.